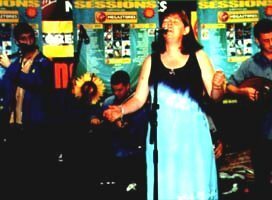 It seemed three years ago that Niamh Parsons was on the cusp of a carer as a contemporary singer, we wondered, and pondered and asked the key question, would she become the new Mary Black?. Back then she was involved with the band the Loose Connections . Times and things musical change and Niamh's career has taken a different route, as Sean Laffey found out when he visited her in her Malahide home. Malahide is one of those sprawling suburbs that surround the city of Dublin, on a good day with free flowing traffic it's just a twenty-minute drive from the City centre. Conveniently close to the orbital M50 and blessed with a new shopping mall this is turn of the century Dublin, comfortably contemporary, a clear contrast to the career course taken by Niamh since the demise of the Loose Connections. It is mid afternoon, I'm running late, I have to give a lecture in Balbriggan and Niamh is heading to Ballymore Eutsace to meet up with guitarist Graham Dunne for a gig. Later I will be meeting Austin Kenny ( he played mandolin with Spud) now he's editing Clancy's Irish Music Radio ( a new web station) , then it's off to catch Susan McKeown, Aly Bain and Phil Cunnighnam in the HQ Hall of Fame. A series of mobile phone calls, and my meeting with Niamh is rescheduled, this is life in the fast lane folks. There is so much traditional music happening now and Niamh is happy to be on the crest of this wave. Our opening conversations hinged on those changes. Niamh is generous in her praise of the small coterie of traditional women singers, many of whom she counts as friends " Its strange and a bit ironic really that Susan McKeown is back in town tonight, she's one of the very few Irish singers still singing traditional songs. Deirdre Scanlan, is doing great things with Solas and she thoroughly deserves her success." She adds as we gossip about the recent line-up changes in Solas. Niamh is fully committed to traditional song and she appreciates other singers who have the courage to take that most demanding of paths in the folk world. Niamh came late to public singing; so is aware of the break with the daily norm that is needed if you arte going to make it as a full time singer "I didn't really start singing as a semi-pro until my early thirties." 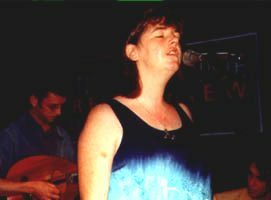 And here is the irony, she was lead singer with Kilera mark one, when that band was reformed Susan McKeown took her place, John Doyle played Guitar, and Ronan Browne on pipes - the connections are nothing like loose. Back in 1997 Niamh was enjoying critical success with Loose Connections, but this wasn't marched commercially or personally. "It is so difficult keeping an acoustic band on the road. After our last Loose Connections tour, we did the maths and found we had personally lost a lot of money. The band members, the roadies and the promoters all got paid but my self and Dee" (Moore, her ex-husband), " we were losing out on every tour. When you turn professional, you cant afford to treat the music as a hobby anymore, and carrying on like that wasn't a recipe to keep the band together or the wolf from the door." Things came to a head and the marriage broke down. "I was devastated by the break up, I don't want to sound melodramatic, but my whole life had been built on the marriage, our daughter and the band. When it all collapsed I was left with a blank page again. Times were tough; (Niamh has a nine-year old daughter to care for). " I sat down and said to myself, yes I really want to be a singer and I want to be a traditional singer. I'd worked in an insurance office for years and I knew that sort of life was not for me. Part of the effort of pulling myself together again was reaffirming my identity, and I did that through my songs." Since her switch back to traditional songs she has released two albums on the Green Linnet label, toured the world, played in Japan, sung at the White House (for President Clinton) toured folk festivals in Europe and established herself as one of the finest singers of her generation. She is constantly in demand for tours and her diary has bookings as far ahead as April 2002 (when she will do a tour of the Netherlands). Has she any notion of why she's so much more successful as a traditional singer? " I don't think it's simply because I'm singing traditional songs, although that must have an appeal; commercially it is much easier to work as a duo than as a band. I am more affordable" (she laughs) "And the other point is that as a traditional singer it is easier to be marketed, promoters know what I am about; they can gauge their audiences and fit me into the right venues." "I want to carry on the tradition as orally as possible." For the past eighteen months or so, Niamh has been working with Graham Dunne, from whom she has learnt about graft, about the professionalism of music. " I really admire how Graham tackles his music. He'll practice a tune for hours on end, until he knows it inside out, at that stage he's able to add even more to the music. Something I have noticed about our live shows, he's able to interject astounding melodic passages into his playing. That skill doesn't come overnight, he's thoroughly professional about it." A great mentor makes a good pupil, so how has this discipline rubbed off on Niamh. "When I am not touring, I practice songs and singing every day. I take a few hours each morning in my lounge, I close the curtains and stand there and sing, pour my heart and soul into it. Its not simply a case of learning the songs and that is hard enough anyway, but its about feeling comfortable with the tunes and lyrics, up to a point where you can say, 'yes, now that song is mine, I can lay a certain claim to it.' Not that any of the traditional songs actually belong to any one singer, we hold them on trust, but that hold has got to be a loving and caring one." And you'd think if death no more." Shortly before the release of In My Prime, Niamh lost her father, Jack, he'd been a stalwart of the Goilin club for years and encouraged Niamh to follow the singing path. "This will be the first Christmas without him, and it's going to be a hard time. He really encouraged my sister Anne and me in our singing. I was very glad he got a chance to hear the album before it was released, because there is so much in it that I owe to him. He was very proud of me for putting those tracks down." Traditional songs can touch the heart like no other form of music, the best singers have the ability to wring out the inner emotions from those songs, but you can't do that as a dry musical experience, you have got to have lived to sings those songs with any authority. Niamh's past three years gave given her enough of the high and lows of life to revive any of our ancient big ballads. It is this strength of tragedy that makes her such a powerful presence and a prime example of the art.